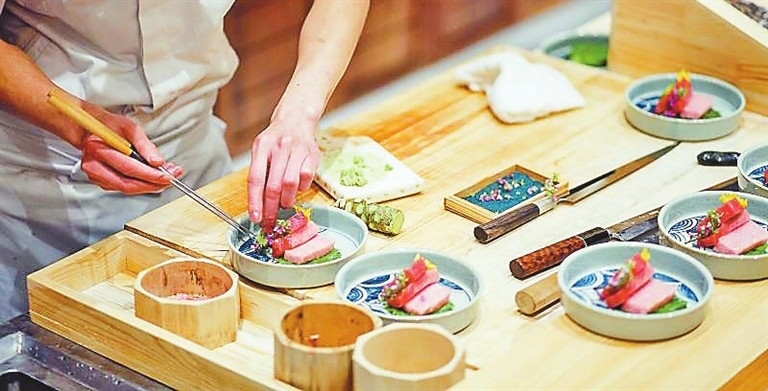 SUSHI Yotsuba or “Si Ye (Literally meaning ‘Four Leaves’) Sushi,” a Japanese sushi restaurant, has recently opened a new outlet at One Shenzhen Bay. The grand opening was attended by more than 100 guests including the restaurant’s partners, suppliers and media as well as experts in the food industry. Sushi Yotsuba is simple in decoration and overlooks Shenzhen Bay on two sides. Looking out from the tasteful Japanese-style terrace, customers will be amazed by the magnificent view of Shenzhen Bay when the night falls. The founder of the restaurant Fan Jinsong explained in a speech that the “four leaves” stand for the happiness of customers, staff and their families, suppliers and shareholders. The “tuna show” was the biggest highlight of the opening night. With a customized long knife, the chef cut the head of a 1.8-meter-long bluefin tuna weighing 101 kg within a few seconds. Then other parts of the tuna were cut, including the face, neck, venter, body, bone and tail. The high-quality flesh of the tuna is a rarity. 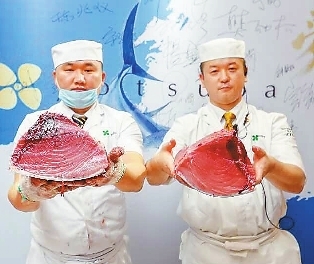 According to Wang Dong, a regional manager in South China of one of the restaurant’s suppliers, the bluefin tuna was shipped by air from Japan’s No. 1 fish farm in Nagasaki. It only takes 48 hours to bring it from the farm to the table. Being expensive and of great quality, the tuna is only supplied to high-end restaurants. 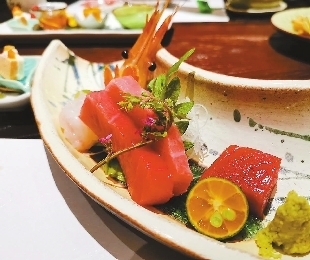 It’s a top cuisine whether cooked as sashimi, sushi, grilled tuna or robatayaki. The restaurant has an open sushi bar which enables customers to interact with the chef and observe the whole cooking process.